KATHMANDU, May 30: In contrary to expectations, the budget of Fiscal Year 2018/19 has just given continuity to the old plans and programs for the development of tourism sector of the country. 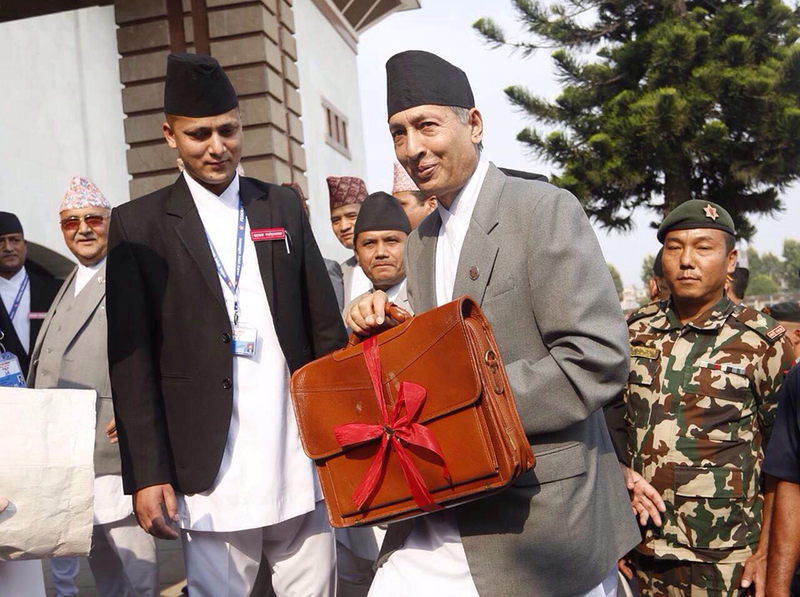 Presenting the Rs 1.315 trillion budget for the FY2018/19, finance minister Yuba Raj Khatiwada said that a total of Rs 5.20 billion has been allocated for the tourism sector of country. However, all the programs he laid out have given continuity to the existing programs. “Works on infrastructure and market promotion will be carried out in order to increase employment and income from the tourism sector. Visit Nepal 2020 campaign will be implemented targeting to bring two million tourists by 2020,” said Khatiwada. Previously, the Ministry of Culture, Tourism and Civil Aviation had set a target of bringing 1.5 million tourists by 2020. Khatiwada said that 100 new tourist destinations will be identified and developed in order to promote both domestic and international tourism. “To promote domestic tourism, ‘Pahile Desh, Ani Bidesh’ campaign will be brought into operation,” he added. Promotional campaigns will be organized inside the country to encourage domestic tourists to visit tourist destinations. The budget further reads that required infrastructure will be constructed to develop Meetings, Incentives, Conferencing and Exhibition (MICE) tourism in the country. President of Hotel Association Nepal (HAN), Amar Man Shakya, said that the government has disappointed the tourism sector by giving continuity to the same old programs and not addressing the sector as an industry. There is an investment of more than Rs 500 billion in the tourism sector, and around Rs 32 billion new investment is being injected in the hospitality sector. “We had expected new things for this industry, but the budget speech has disappointed us,” Shakya added. Likewise, Sunil Shakya, chairman of Pacific Asia Travel Association (PATA) Nepal chapter, said the budget should have included two major components in order to develop the tourism industry: human capital development and infrastructure development. The budget has allocated a total of Rs 19.35 billion for the aviation sector. “Budget has been allocated to begin construction of Second International Airport (SIA) at Nijgadh in Bara district, expansion of Tribhuvan International Airport (TIA), construction of Pokhara International Airport, and construction of Gautam Buddha International Airport,” reads the budget speech. Likewise, Biratnagar, Janakpur, Nepalgunj and Dhangadi airports will be upgraded as regional airports and flight operation to neighboring countries will be started from there. Minister Khatiwada also said that Dang airport would be upgraded as an alternative for domestic airports. Meanwhile, feasibility will be conducted and construction started for the airport in Kavre district. “A master plan will be prepared for the expansion of domestic airports. Helipads at local levels will be constructed for emergency rescue of tourists and locals,” Khatiwada added.